Welcome to the first instalment of a series I’ve been wanting to start for a while now – “Recovery Resources”. In this series (which I hope to publish once every week or two) you’ll find short introductions to fundamental resources that I have found helpful in my fight with mental illness so far. Obviously, what works for one might not work for all, but you won’t know what works for you until you try – so I encourage you to keep different options in the back of your mind and to reach out with any questions you might have or even pursue further research into things that sound like the might be beneficial to you. I hope you guys keep an open mind and I would love to hear from you about your own personal experiences with the skills I share. For the past few months I’ve been pursuing several different treatment options for my mental health and been having resources thrown at me from left and right. I hope this blog series will be helpful not only for me to collect, summarize, and better remember the skills I’m trying to work on myself, but also for those who might benefit from a different suggestion or an extra resource here and there. DISCLAIMER: I am in no way claiming to be a healthcare professional – the opinions expressed here are from my own experience and I will reference the clinical material I share as best as I can. First and foremost I recommend that you to go see your primary care physician or mental health specialist. Today’s instalment focuses on awareness and reflection – fundamental requirements for change. I think one of the most harmful messages perpetuated in society nowadays is that being “emotional” is a sign of weakness or fallibility but despite what society tells us, cultivating this kind of self-awareness is in fact a sign of strength and makes us more effective and happy overall. Noticing how we’re feeling might sound simple enough, but in itself this can be incredibly difficult. For whatever reason many of us come to believe that maybe our emotions aren’t safe or productive, and oftentimes they can simply be overwhelming and unpleasant. In a society that is constantly giving us ways to be removed from our own experiences, it can be more than appealing to use them to distract ourselves from what’s truly going on. If you had told me “you can’t heal what you can’t feel” a few months ago, I probably would have smacked you. To my knowledge, I was feeling far too much, and barely staying afloat, so asking me to “feel more” would have seemed impossible. But only now do I realize that feeling completely overwhelmed, lost, and in pain was a culmination of a decade and a half of suppressed emotions. After spending most of my life running from what I was afraid to feel and completely unaware of everything else (essentially living in ignorance of my own emotions) it become clear to me that this is part of the reason I’ve always ended up in the same self-destructive cycles. I finally realize that I’ve yet to find happiness because I’ve been looking in all the wrong places and I can only hope to come closer to finding what makes me happy if I first have awareness of what that might be. While I’m still far from what I’d like, I’m at least beginning to rule out what I know I don’t. “Busy is great armour, it’s a great way for numbing. What a lot of us do is that we stay so busy, and so out in front of our life, that the truth of how we’re feeling and what we really need can’t catch up with us” – Brene Brown. It’s common to try and escape, suppress, or avoid unpleasant feelings or experiences, but there’s a large body of evidence suggesting that the opposite is far healthier. Whatever we turn to in attempt to “control” our emotions can often end up being harmful and takes us farther away from acknowledging the reason the emotions arose in the first place. Emotions are evolutionary, and choosing to neglect what might not be pleasant to experience may temporarily allow us to avoid pain and discomfort, but doesn’t allow us to tune into the underlying problem that stirred up feelings in the first place and only sets us up to for more suffering in the long-term. Not every feeling is going to require a response but many of them come around as little reminders about how we’re doing and can even be good sources of information about our responses to people, situations, and experiences. Unfortunately, no matter how hard you try, and believe me – I’ve tried, you can’t selectively choose to avoid unpleasant emotions without also cutting out the good ones. The complicated reality of the human condition entails the full spectrum of emotions that comes with it. Be curious about what a feeling is trying to tell you. Attempt to take a non-judgmental perspective on what experiences are coming and going. A key component of mindfulness (yes, the buzzword of Western society right now) is practicing observing and describing our experiences. Observing asks us to notice what is happening while avoiding thinking of what “might” or “should” be, and not to hold onto labels or interpretations we might be tempted to attach to particular situations. By observing we can notice our experiences, thoughts, and feelings in a detached way without getting caught up in them. Setting reminders on my phone – that prompt me to take a minute out of my busy day and reflect on my personal experience. Writing in a journal every evening – because “writing can help us hear our own voice” and it draws my attention to concrete ways that I can gently redirect the judgmental tone of my reflection. Practice first observing the physical – Things like yoga, simple deep breathing, meditating, stretching, and walking give me an opportunity to refocus and bring myself back to my own physical experience. It doesn’t have to be complicated – it can be as simple as stretching for a few minutes every morning or evening or shutting off your phone on the walk to work. Starting to notice your physical experience can help you clue in to the effect emotions can have on your body. Another important piece in becoming mindful of our thoughts and feelings is learning to describe what we observe without making judgments. If you notice yourself making inferences, distortions or exaggerations redirect your focus to “just the facts”. People often recommend thinking of your thoughts as clouds drifting by, or waves lapping at a shore, or even balloons being released into the sky. Some of these things can be done physically too (i.e. by writing thoughts on pieces of paper and casting them away). 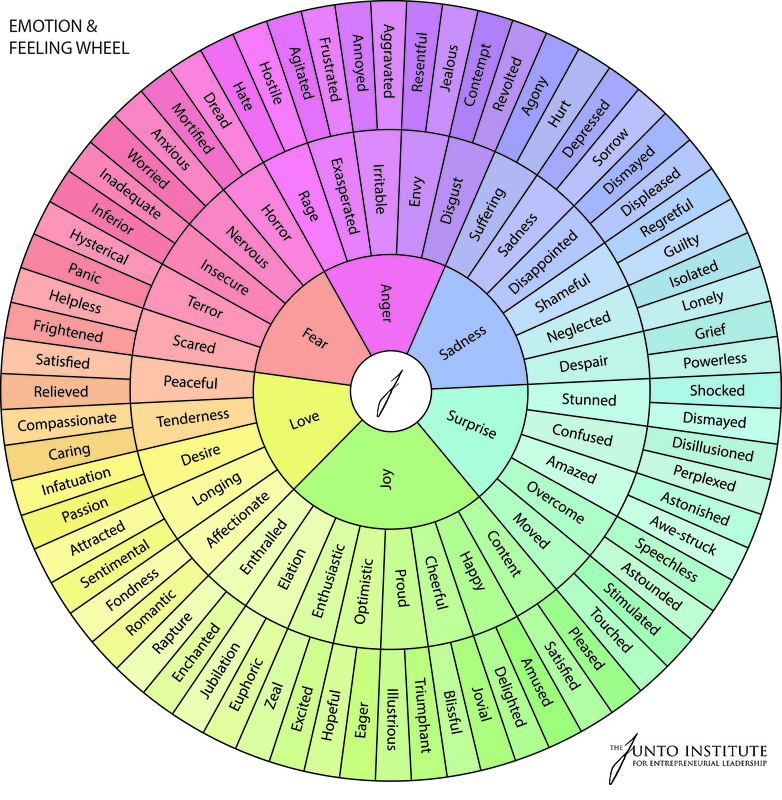 Using resources or references like this emotion wheel to help find names for these specific feelings I can’t identify. Searching through free Spotify or Youtube playlists about a certain genre or mood can be great for this. Keep in mind that building a new practice takes time and patience. All you can do is keep trying different things until you find ones that work well for you and keep reminding yourself of the benefits of doing so. Once having identified our emotions, it’s important to respond with self-compassion – i.e. think of how you would respond to a child, a loved-one or friend. Remember that emotions are not consciously controlled and you are not to blame for how you feeling. They do not define you nor are they good or bad. They just are. Emotions are evolutionary and you are not alone in feeling this way. Oftentimes you might find your emotions to feel illogical or lacking supporting “evidence” — this is also okay (and common if you are someone who struggles with mental health problems) but remember that feelings in and of themselves are not going to hurt you, but using destructive ways to avoid them might. Remember that you are okay (and I’ll be posting about distress tolerance soon).